Would you like to have a giant pig in Minecraft? It Fell From The Sky 1.7.2 is one of those mods which has not something very useful but instead has funny entertainment. 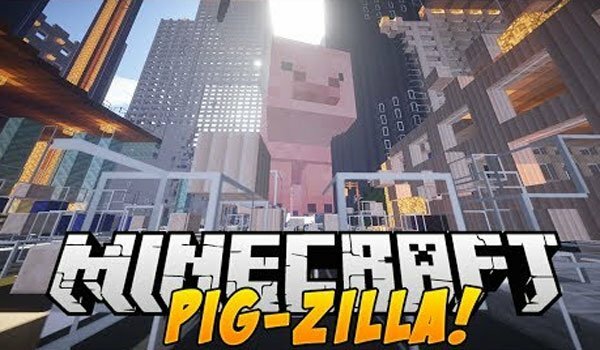 In this case you will have a giant pig called Pigzilla, for the community. The mod adds a simple crafting, 9 pieces of raw pork to obtain a pork block. Then you have to place this block on the floor, and take a Wither Star with your hand, then do right click to the pork block. Suddenly it will appear a giant block that will impact the ground, sweeping everything in its path, like if it was a meteorite. A few seconds later our PigZilla will appear. If this was not enough, you can use a fishing rod with a carrot to lead our giant pig. To ride on, right-click between the legs of pork at a height close to the ground. It is advisable to invoke it into a new world because it will destroy everything around it. How to install It Fell From The Sky Mod for Minecraft 1.7.2?